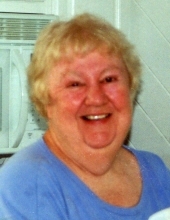 Marie Betz, age 77, of Zelienople, passed away on Wednesday, April 10, 2019 while under the care of Good Samaritan Hospice in Wexford. Born April 28, 1941 in Enon Valley, Pennsylvania, she was the daughter of the late Raymond and Pearl Smith Rhodes. Marie was a member of St. Gregory Catholic Church in Zelienople where she was known for lighting candles. She graduated from Ellwood City High School. Marie was a former member of the Evans City Senior Center, and a proud member of the drum circle while she was there. She enjoyed playing cards and entertaining family and friends at every opportunity. Above all, she loved her family and treasured the time she spent with them. Marie leaves behind to cherish her memory, her daughters, Valerie Ketterer and her husband, Dean, of Cranberry Twp., and AmyJo Fischer and her husband, Steven, of Midlothian, VA; her four grandsons, Dean and Darien Ketterer, and Michael and Nicholas Fischer, and several beloved nieces and nephews. In addition to her parents, she was preceded in death by her husband, Joseph R. Betz; two sisters, Ethel Betz and Alice Simpson, and a brother, Sonny Rhodes. Marie’s family will receive friends on Friday, April 19, 2019 from 4 P.M. to 8 P.M. at the Boylan Funeral Home, Inc., 324 E. Grandview Ave., Zelienople, PA 16063. A memorial service will be held in Marie’s honor at 11 A.M. on Saturday, April 20, 2019 at the funeral home. In lieu of flowers, the family suggests that memorial contributions be made in Marie’s honor to Good Samaritan Hospice, 146 Neely School Rd, Wexford, PA 15084. To send flowers or a remembrance gift to the family of Marie Betz, please visit our Tribute Store. "Email Address" would like to share the life celebration of Marie Betz. Click on the "link" to go to share a favorite memory or leave a condolence message for the family.